Randall Heddon is Arizona’s and America’s premier speed-painter. 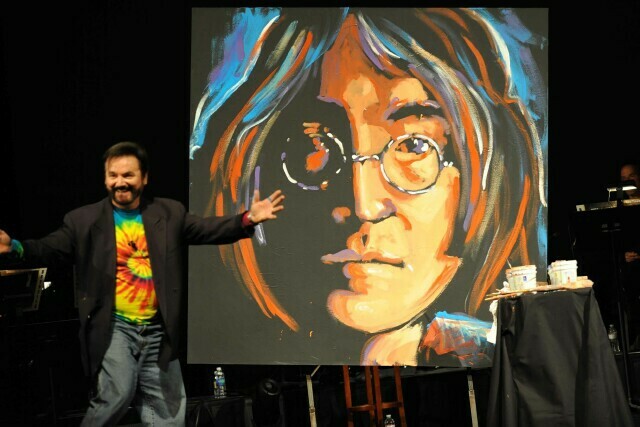 Imagine, if you will, your audience surrounded by the Beatles’ “Revolution”, when Randall enters the stage and using brushes, hands and other objects begins painting on his spinning canvas, and after a few minutes, the “A-Ha” moment comes when the audience realizes he is creating John Lennon, and in less that 10 minutes of movement and color, there is an amazing painting of Lennon! OR…… The subject may be the company CEO, a VIP, a logo or an individual being singled out for a particular achievement or award! There are a great number of ways that “TributeArt Live!” can be utilized to brand your organization or event. “TributeArt Live!” engages the audience in a creative journey, stimulating their senses and captivating their interests as the original artwork featuring the iconic celebrity or company subject comes to life on canvas, accompanied by their own music with each painting taking 10-15 minutes to create!